Canadian country-folk legend Stompin' Tom Connors, whose toe-tapping musical spirit and fierce patriotism established him as one of Canada's strongest cultural icons, has died. Canadian country-folk legend Stompin' Tom Connors, whose toe-tapping musical spirit and fierce patriotism established him as one of Canada's strongest cultural icons, has died. He was 77. Connors passed away Wednesday from what a spokesman described as "natural causes." Brian Edwards said the musician, rarely seen without his signature black cowboy hat and stomping cowboy boots, knew his health was declining and had penned a message for his fans a few days before his death. In the message posted on his website, Connors says Canada kept him "inspired with its beauty, character, and spirit, driving me to keep marching on and devoted to sing about its people and places that make Canada the greatest country in the world." 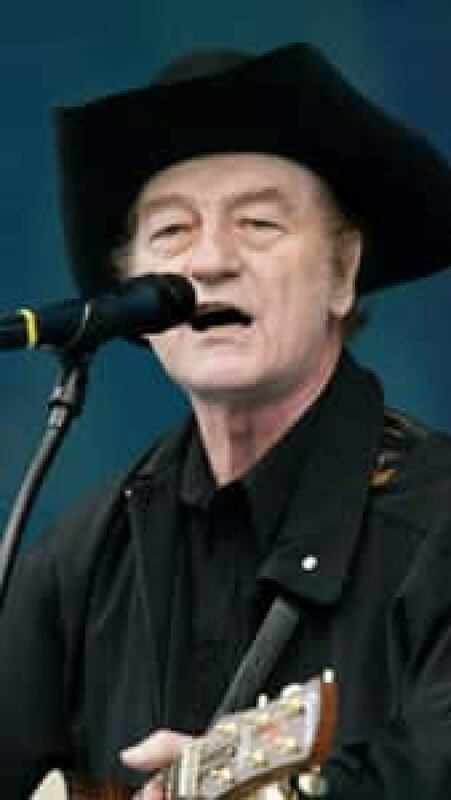 The National Hockey League tweeted "Sad to hear that legendary Canadian Stompin' Tom Connors has passed. His legacy lives on in arenas every time The Hockey Song is played." Dubbed Stompin' Tom for his propensity to pound the floor with his left foot during performances, Connors garnered a devoted following through straight-ahead country-folk tunes that drew inspiration from his extensive travels and focused on the everyman. Although wide commercial appeal escaped Connors for much of his four-decade career, his heritage-soaked songs like Canada Day, Up Canada Way, The Hockey Song, Bud the Spud, and Sudbury Saturday Night, have come to be regarded as veritable national anthems thanks to their unabashed embrace of all things Canadiana. Still, Connors often complained that not enough songs were being written about his homeland. "I don't know why I seem to be the only one, or almost the only one, writing about this country," Connors said in a rare one-on-one interview at his home in Halton Hills, Ont., in 2008. "It just amazes me that I've been going so long I would think that somebody else (would have) picked up the torch a long time ago and started writing tons of songs about this country. This country is the most underwritten country in the world as far as songs are concerned. We starve. The people in this country are starving for songs about their homeland." Connors' fervent patriotism brought controversy when his principles put him at loggerheads with the Canadian music industry. In 1978, he famously returned a handful of Juno Awards he had amassed in previous years, complaining that some artists were being awarded in categories outside their genre while other winners had conducted most of their work outside of the country. He derided artists that moved to the United States as "border jumpers." "I feel that the Junos should be for people who are living in Canada, whose main base of business operations is in Canada, who are working toward the recognition of Canadian talent in this country and who are trying to further the export of such talent from this country to the world with a view to proudly showing off what this country can contribute to the world market," he said in a statement at the time. The declaration marked the beginning of a 10-year self-imposed exile from the spotlight. From Connors' earliest days, life was a battle. He was born in Saint John, N.B., on Feb. 9, 1936 to an unwed teenage mother. According to his autobiography, Before the Fame, he often lived hand-to-mouth as a youngster, hitchhiking with his mother from the age of three, begging on the street by the age of four. At age eight, he was placed in the care of Children's Aid and adopted a year later by a family in Skinner's Pond, P.E.I. He ran away four years later to hitchhike across the country. Legend has it that Connors began his musical career when he found himself a nickel short of a beer at the Maple Leaf Hotel in Timmins, Ont., in 1964 at age 28. The bartender agreed to give him a drink if he would play a few songs but that turned into a 14-month contract to play at the hotel. Three years later, Connors made his first album and garnered his first hit in 1970 with Bud The Spud. Hundreds more songs followed, many based on actual events, people, and towns he had visited. "I'm a man of the land, I go out into the country and I talk to people and I know the jobs they do and how they feel about their jobs," Connors has said. "And I've been doing that all my life so I know Canada like the palm of my hand. I don't need a map to go anywhere in Canada, I know it all." In 1988, Connors emerged from his decade-long protest with the album Fiddle and Song, featuring a new fiddle style and the songs Canada Day, Up Canada Way, Lady kd lang, and I Am the Wind. It was followed in 1990 by a 70-city Canadian tour that established him as one of the country's best loved troubadours. But his strong convictions about the music industry remained. Connors declined induction into the Canadian Country Music Hall of Fame in 1993. Accolades he did embrace included an appointment to the Order of Canada in 1996, and his own postage stamp. "Whatever I do, in my writing, I do it for others," Connors said in the 2008 interview. "I do it for my country and I do it for my countrymen and that's the only value that I really have. If there was no money in this, I'd be doing it anyway. I've always been that way. Because it's what I am."